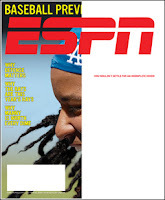 Case in point- ESPN Magazine. 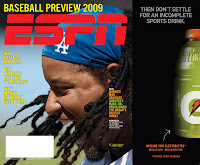 Powerade apparently decided that the inside front cover was just not good enough and at this point the mag would probably stop at nothing to improve its numbers. The front cover reads "You wouldn't want an incomplete cover" ... open the flap and read "Then don't settle for an incomplete drink". Genius. Tiger wouldnt settle, Federer wouldn't, I mean neither would I, I say as I walk out of Universal News flipping through the mag with a Powerade in hand. Will tampering with the usual standard cover draw more readers and more dollars in? In the past few weeks Derek Lam and Zac Posen have unveiled ad campaigns even during these tough times. Maybe they have taken cues from Timothy Geithner and decided to follow the stimulus model of pumping more money into their biz in order to stay alive. Or maybe they need to pimp out a Vogue cover with a fold out fur lined advert. Esquire has also followed suit with a mix and match cover because one cover model just won't cut it these days.